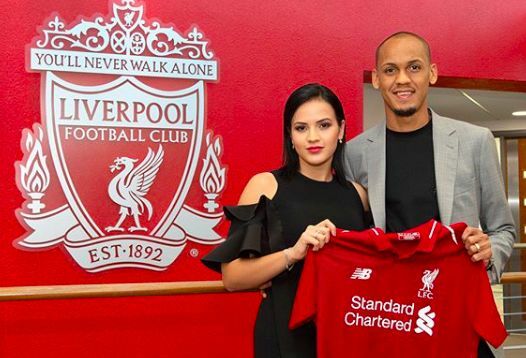 Rebeca Tavares has seemingly dismissed speculation linking her husband Fabinho to a shock Anfield exit. Recent reports claimed Liverpool would be prepared to sell the Brazilian as a means of funding a move for Borussia Dortmund starlet Christian Pulisic. It was meanwhile suggested the Reds would consider loaning the summer signing out, with AC Milan being named as potential suitors. Needless to say such were rumours were misguided having emerged just months after Liverpool paid around £44million to sign the midfielder from Monaco. Wife Rebeca, who has grown to be a popular figure among Reds on social media, took to Twitter to respond to the claims. Fabinho didn’t feature at all in Liverpool’s first eight Premier League games of the season as Jurgen Klopp opted to ease him into a significant change in intensity. He has since featured sporadically and displayed mere glimpses of the physical authority and positional intelligence that drew Klopp to his services in the first place. It was always going to take some time for him to adjust to the Reds’ setup and approach, which has rarely included the use of an orthodox defensive midfielder. Though he still remains someway off his best, it is becoming increasingly clear just how important he can be moving forward.